Past the Star Treks, past the Dungeons and Dragons, Magic the Gatherings, Math/Science Olympiads, dateless proms, and Chess Clubs—if you were a nerd at any point in the past 50 years your mental erogenous zone had a Teen Beat crush on Stephen Hawking. He was brilliant, his physics were a source of admiration. More important than brilliant, he made the math relatable; to this day his pithy quotes convey conceptual and abstract reality to the masses in a way that allows our species to advance our understanding of ourselves and our place in the cosmos. More important than relevant, he was worse off than we were physically, but still roped a hottie for a wife. Twice. Not bad for a guy who can’t move and talks like Speak and Spell. He was our beacon of romantic hope; the tragic, progressively paralyzed father figure we never had, but would try to feel closer to by typing self-affirming phrases into our Speak and Spell: You are smart. She will regret not knowing you. Everyone wets the bed. We should have spent more time on the Speak and Spell lessons and less time punching in obscenities for it to say in order to convince our sister it had Tourette’s. That our excitement and bio up to this point was based by the related and foundational truth that we can’t spell and didn’t know that Stephen Hawking is both dead and not in the R2AK. What we know now is that Steve Hocking is alive, not amused, and joined by his kids, Amber and Aaron, and some guy named Matt, and another guy named Shad (not a small fish, we checked. 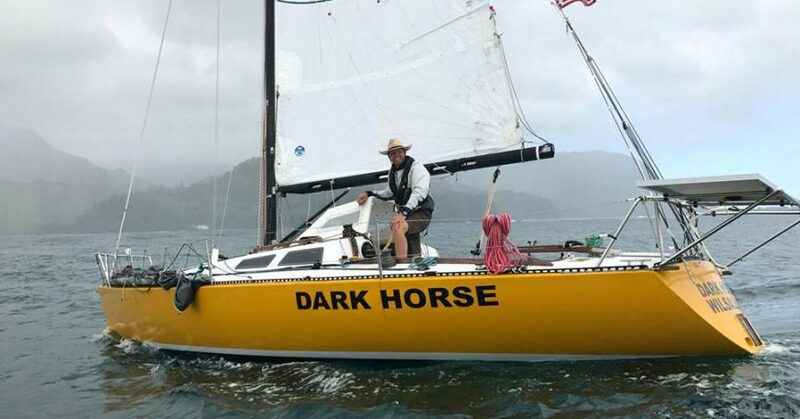 Pretty gun-shy about facts at the moment) to run the R2AK in 2019 in an Olsen 30 (decent monohull, also fact checked). While we are sure that Steve is in the middle of a middle finger eye roll at a joke so tired in his life that it’s eclipsed ‘Chicken vs Road’ for unfunny, we are also sure that the Hockings (and Matt and Shad) could sail circles around the late author of such dusty shelf hits as The Development of Irregularities in a Single Bubble Inflationary Universe. Pansy. While they might not have mathematically described the collapse of gravity, or whatever, Team High Sea Drifters’ sailing experience might allow them to tack out of that black hole named after…well, let’s just say ‘not them.’ Single handed Transpacs, family jaunts around VanIsle, racing in that wind hole of a bay named after San Francisco, certifications galore, current and past marathons, twice-a-week karate/yoga, plus a throwback: Steve imposed an 8-month forced march sail in and around the Inside Passage/sentence for the Hocking kids while they were in their tweens. Shad brings the heat of solo ocean experience, and the Olsen 30 that he’s bringing from the great seafaring state of Montana—a solid choice, bonkers yellow monohull with a solar array approaching red dwarf in scale. Welcome to the R2AK, Team High Sea Drifters. If it helps, we feel your pain; people still call this thing the Y2K.